Made in Japan examines the artistic dialogue between East and West as it played out between 1945 and 1970. During this post-World War II period, Japanese printmakers effectively acted as ambassadors, bringing their venerable aesthetic traditions into fruitful interaction with contemporary American trends and forging ties with artists, scholars, museums and collectors. The Creative Print (sôsaku hanga) movement originated in the early 20th century, when Japanese artists sought to modernize their practice by embracing Euro-American concepts of originality and autonomy. The movement matured in the decades following World War II, when second- and third-generation sôsaku hanga printmakers continued to experiment in terms of style, technique and subject matter. From the early 1950s, Japanese printmakers participated in a newly global art scene, achieving great success at international art exhibitions sponsored by the American and Japanese governments. Made in Japan recollects a fascinating but little-known instance of the East-West dialogue that continues unabated today. This exhibition is organized by the Milwaukee Art Museum and curated by Glenn Adamson, curator of the Chipstone Foundation and MAM adjunct curator, with consulting curator Alicia Volk. The exhibition is sponsored by the Blakemore Foundation and Toshiba International Foundation. The exhibition travels to The Morikami Museum and Japanese Gardens, Delray Beach, Florida, Oct 4–Dec 31, 2005. Sekino, Jun'ichirô, Aquarium, 1956. Color woodcut on Japanese paper. 22 1/4 x 17 3/4 in. Gift of Dr. and Mrs. William Frackelton. Amano, Kunihiro, Morning Moon P, 1961. Color woodcut on Japanese paper. 15 1/2 x 21 9/16 in. Gift of Dr. and Mrs. William Frackelton. 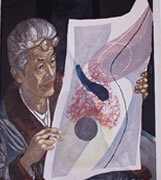 Sekino, Jun'ichirô, Portrait of Kôshirô Onchi, 1952. Color woodcut on Japanese paper. 9 7/16 x 21 7/8 in. Ed. 34/100. Milwaukee Art Museum, Gift of Dr. and Mrs. William Frackelton.